Get your brightest bright for your funnest festival season. Receive complimentary professional teeth whitening, enjoy the free Cuvée Beauty hair braiding bar* with our friends at RPZL, and get a free fanny pack loaded with festival gear (while supplies lasts) when you attend GrinFest! What better way to enjoy festival season than with your friends? Bring your vibe tribe, so you can all feel festival-ready this season! Extra perk: Both you and your friends can earn $50 in Ticketmaster Ticket Cash if your friend(s) book and complete a free 3D scan at the Flatiron SmileShop on the day of GrinFest! Book a Scan Now! We've connected our? 225 state-licensed dentists and orthodontists to?500,000 customers like you to receive straighter, brighter smiles. ?We are so excited that you’ve started your journey with us, and that's why we’re offering our Club members and their friends exclusive events and giveaways every week. At SmileDirectClub, we make it more convenient than ever for you to get a smile you'll love. 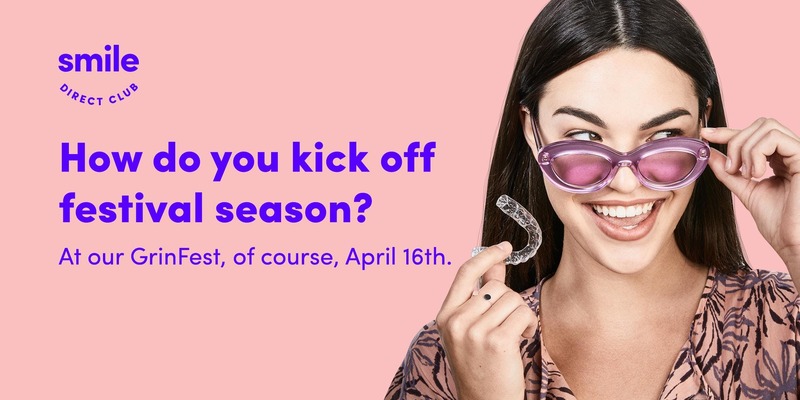 ?We straighten smiles for 60% less than other teeth straightening options by eliminating in-office visits and?sending invisible aligners directly to you. No braces, no waiting rooms, no paying a fortune. Thank you for being a loyal customer and congrats on your new smile!